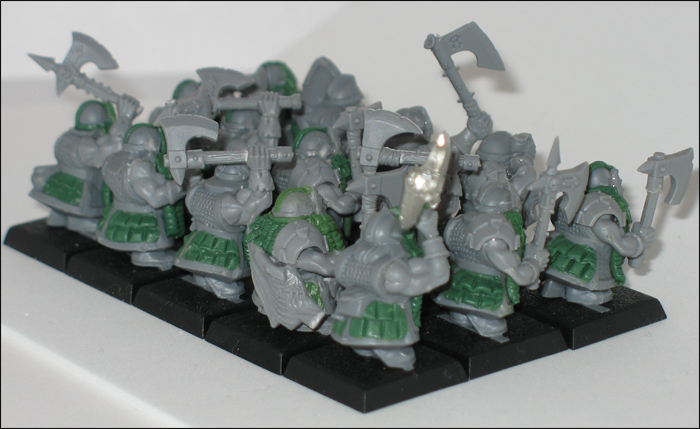 Like many others, I have been inspired by Exquisite Evil's work with the Battle for Skull Pass Dwarfs. 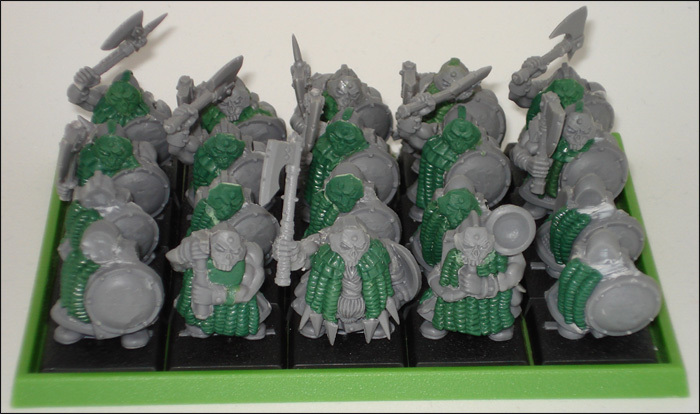 I ordered 48 Dwarf Warriors from http://www.bwbits.com and also acquired a set of Dwarfs from BFSP for 20 bucks Canadian. Just yesterday I got the set of Dwarfs and soon I should be receiving my 48 plastic models. I have already started working, and it's time consuming but exciting. I have removed the excess plastic from all 9 Warriors, this includes the arms, the shield icon, the beard, and the face. This was fairly easy to do with just an exacto knife. Next I added the beards by rolling thin green stuff and adding the detail. 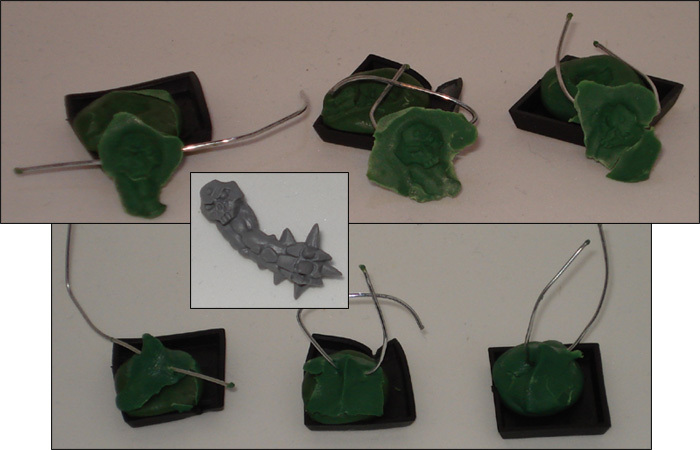 Then I glued on the skull mask using the bit from the chaos mutations sprue (the one with the spiky hammer fist). I then took marauder right arms (the ones with no hands) and glued them on as well as the small marauder shoulder pad. 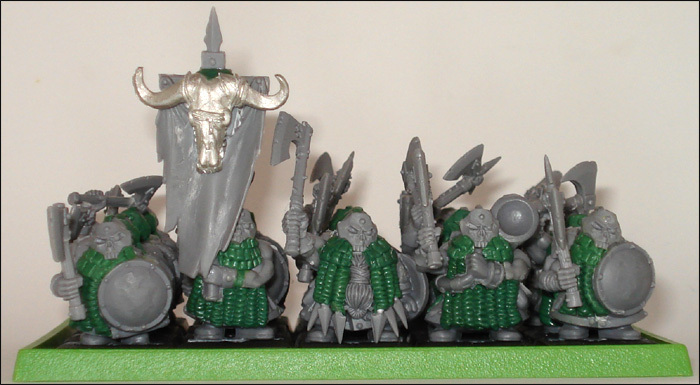 As I add to it, this thread will become a conversion guide for BFSP Dwarfs into Chaos Dwarfs. 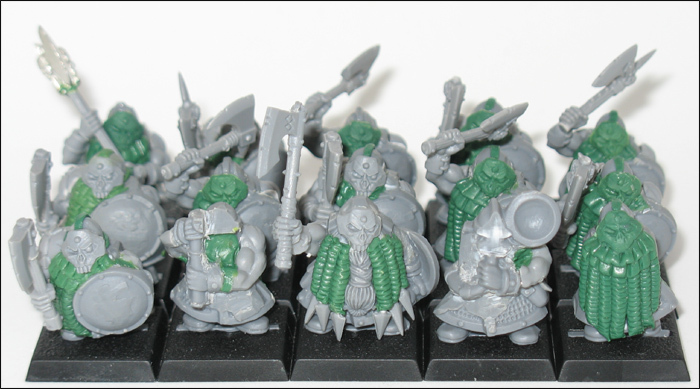 Additionally, I welcome any ideas for converting BFSP models into other Chaos Dwarf units. 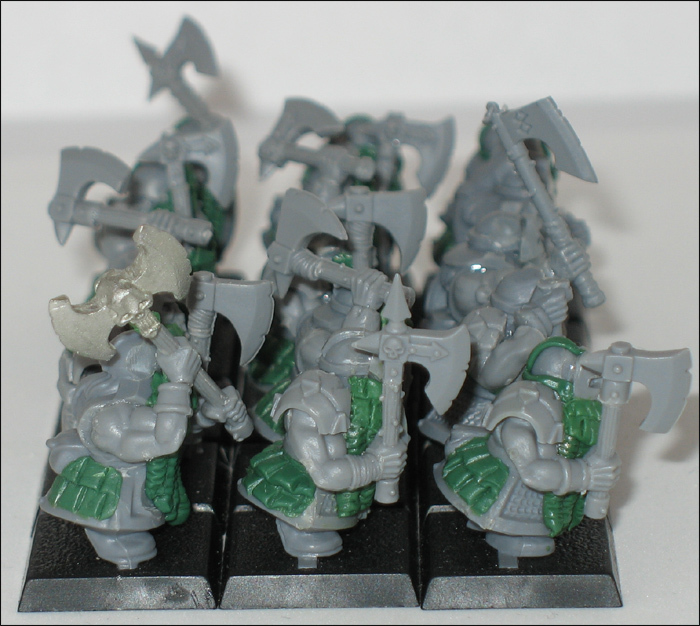 - Using the Thunderers as Chaos Dwarfs with Great Weapons by cutting off their arms, and shaving down their front. Then adding the marauder flail arms with an axe head on top. This post was last modified: 02-13-2007 11:19 AM by Xander. Woah, the Bull Skull is new. Where is that bit from? i konw, i know! it is from a beastmen carriot! I actually took off that Bull Skull and replaced it with a Plastic bit modified to look like a Bull Skull. It was tipping too easily before... and making me mad. I have just primed this unit today, and will be painting as much of it as I can tomorrow. So stay tuned! This post was last modified: 02-20-2007 02:05 AM by Xander. Btw, can you add up a way to convert Blunderbussiers? Also, a good way to prevent the Bull Skull from tipping over as much is to glue bigs of scrap metal bits to the bottom inside of the base. If you can find any metal heads, glue them to the corners if you have room, and paint them to appear gory and decapitated. This post was last modified: 02-20-2007 05:19 PM by Bill-117. Snotlings Blunderbusses are great, so check out his. I haven't really made a bunch of those yet. The weight could not be overcome with counterweights on the base, which is why I had to replace it. Wow, those are some really nice models! I've just started a chaos dwarf army using some 6th edition Dwarfs but I'm stuck as to how to do the beards and would appreciate anyone's advice. Also Xander, how do you do the GS molding for the masks? I've tried this but it just doesn't seem to work for me. This post was last modified: 03-22-2007 04:50 PM by Xander. Thanks, that vid really helped, my attempts at making moulds for the masks are failing miserably though! 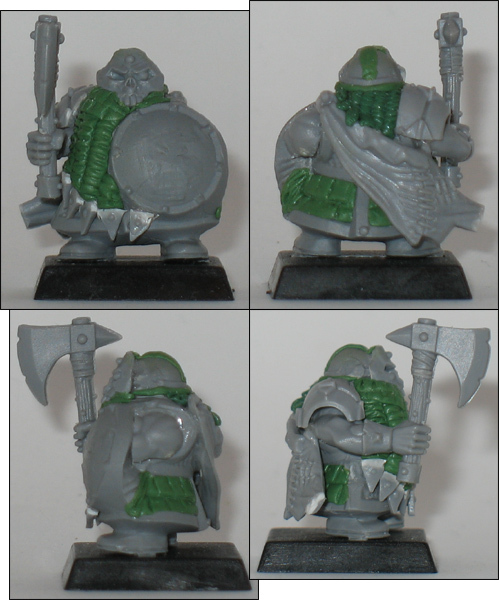 I've just finished my first CD using a sixth edition model using similar principles to the ones here, but with a much worse beard (I hadn't seen the vid at this point) and with the back of the helm made from green stuff. My chaos dwarfs are on the move! I would also like to know how you molded the masks. The pictures give a good idea, but I've never done anything like that before. 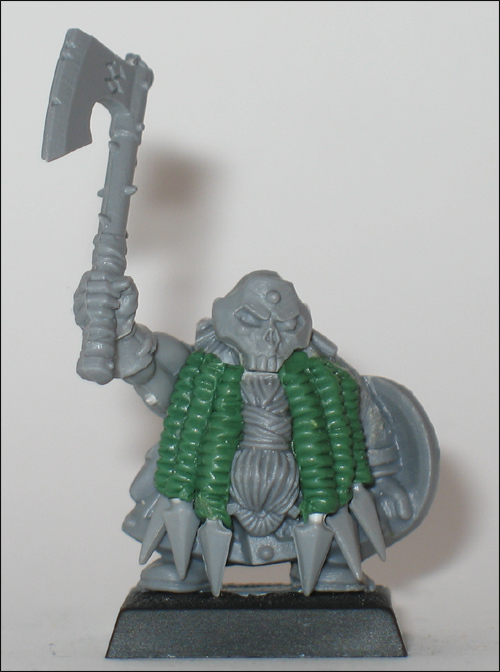 Your video guides are excellent and easy to follow, so I might try Chaosifying the dwarf that came free with WD. Greeting Peturabo (is that the Iron Warriors Primarch? btw). Those interested in casting greenstuff should check out these links. No doubt Xander has some tips and tricks, but these should help. I essentially follow what this guy has done. The key factor is a "mold release agent" which is a fancy way of saying "something that makes sure the fresh GS doesn't stick to the mold and become impossible to remove." I either use a water-based lubricant or just a tad of water with wire handles so I can rip out the gs once hardened. This post was last modified: 04-08-2007 01:08 PM by Xander. Thanks, I've got that working now I use vegetable oil as a mould release agent, and that works fine. Thanks to everyone here for contributing - we finally have a new "unified look" for the chaos dwarfs! could we maybe see the pics of this unit painted that are shown at the start of the hobbo video? please!? Theres some pictures of them......painted that is. 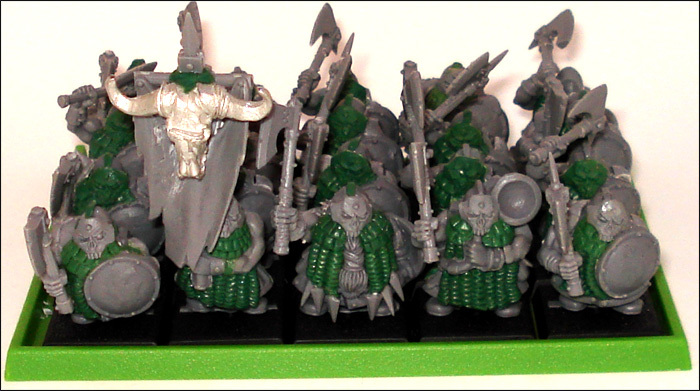 Thus a miracle was born"
Working on a karak-a-karak dwarf army and Archaons Horde. 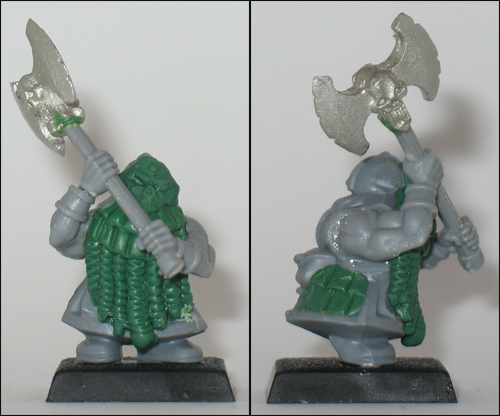 Is there any way you could make a green stuff mould for the curly beards and just stick the the moulded one onto the dwarf?